A salad can be a feast for the eyes, which comes before the desire to eat it! We often enjoy a salad as dinner, or with dinner. Variety in color enhances the nutritional value of the meal. Salads are versatile: you can use what’s left in the fridge. It’s fast, easy and economical. 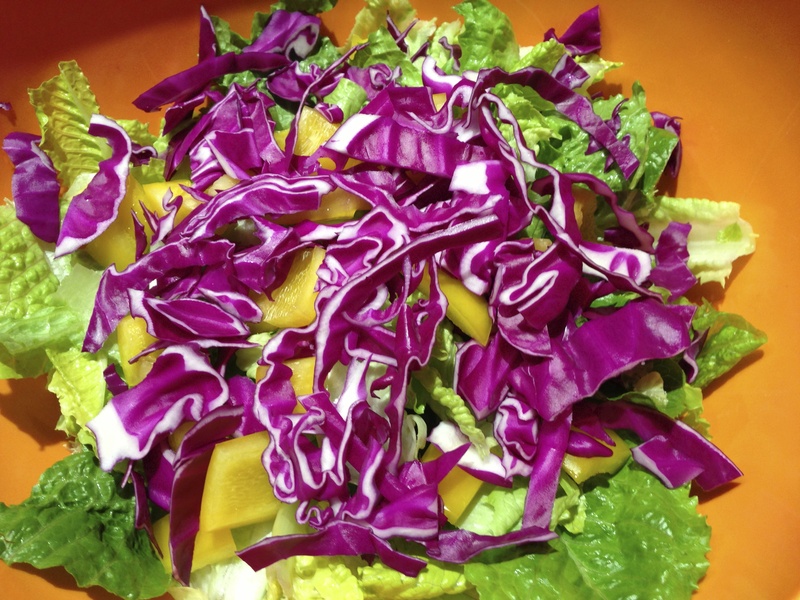 This salad has only green leaf lettuce, red cabbage and yellow peppers. It is tossed simply with extra virgin olive oil, balsamic vinegar, and a dried spice consisting of garlic, chili pepper and a little salt. While delicious on its own, you can make it dinner by throwing in small blocks of cheese, leftover roasted chicken, tuna, canned salmon, avocado, or sunflower seeds. You can make it a little sweet by adding dried cranberries, orange slices (fresh or mandarin), apples, gorgonzola (Waldorf style). You can add other greens or red lettuce, radicchio, broccoli, cauliflower, etc. A salad is really whatever you choose to put in it! Just stay away from the creamy dressings, caesar dressing (VERY high in fat/calories) and bacon, and your meal will be very healthy. I don’t often use canned goods and packaged spices, but if you find good ones, there is no reason not to when you are in a hurry. 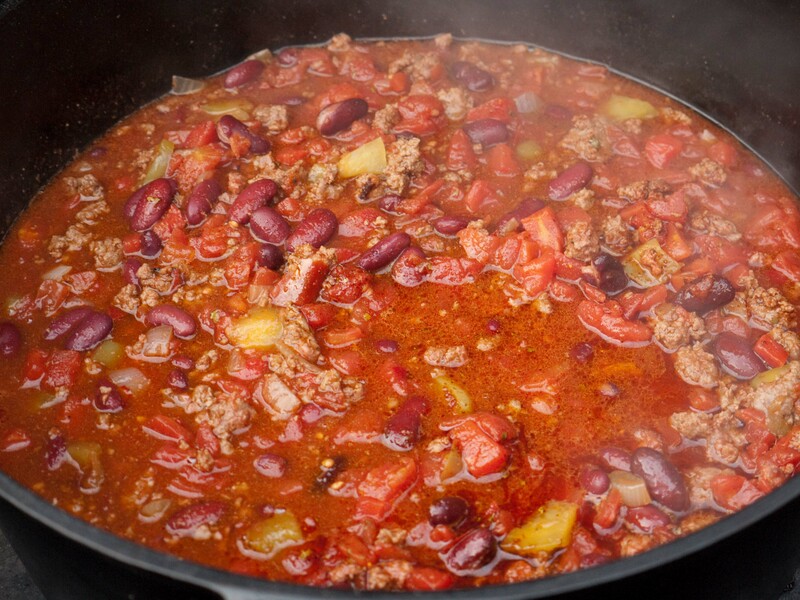 This recipe doesn’t take long to prepare, but you want to plan to be around the house to stir frequently so the beans don’t burn to the bottom of the pot. The healthy beans and tomatoes make this a powerhouse of good nutrition. This recipe makes 6-7 quarts, enough for a couple of family dinners and some for the freezer. I package it in portion sized containers for fast defrosting and eating. 3 15.5 oz. cans of beans, drained and rinsed of the starch. Use any small beans such as navy, pinto, black, etc. I like to mix mine so I get the benefits of the nutrients in the different beans. 1 15 oz. can of corn (no added sugar or salt). This will be added toward the end of the cooking cycle. 2 packages of chili seasoning mix (more if you like it very hot. Two packages gives it a little kick). Note: look for a brand that has no preservatives or other chemicals. The ingredient list should have just spices. I use Sauce Supreme, which I find in the job lot store. Brown the onions in a small amount of oil, in a large, heavy stock pot. Put aside. Brown the chopped turkey/chicken in oil (because there is little fat, it will stick to the pan. If you want to eliminate the oil, or use less, use a non-stick pan). Add the crushed tomatoes, rinsed beans, water and chili seasoning. Simmer on a medium to low temperature. You want it to bubble slightly, but not burn on the bottom. Stir every 10 minutes, making sure to scrape the bottom of the pot so the beans (which are heavy and settle) won’t burn. Cook for 2 hours to soften the beans and meld the flavors. Add the corn in the final 10-15 minutes. Serve immediately or cool and refrigerate. Leftovers may be frozen. While this recipe is not ultra low in calories and fat, it is considerably healthier than the standard preparation. Therefore, you can enjoy the old standard with less guilt. The recipe is easy to prepare, satisfying , and heart healthy. It is also suitable for diabetics. Preheat the oven to 450 degrees. Put an oil sprayed wire rack on a baking sheet. Put flour in one shallow dish and eggs in another. Mix parmesan cheese, garlic powder , Italian seasoning and breadcrumbs and place in another shallow dish. Coat each tender in flour. Shake off excess and coat each tender with the beaten eggs, then roll in breadcrumb/parmesan cheese mixture to coat thoroughly. Place the tenders on the wire rack, spray with cooking spray and bake for 10 minutes. turn them over, spray the tenders and put back in oven for about 10 minutes more, until crisp. Serve with marinara sauce or offer a variety of sauces like sweet and sour, teriyaki, etc. Serving size=4oz. 335 calories per serving; 12 grams of fat (4 saturated); 132 mg cholesterol; 23 grams carbohydrate; 31 grams protein; 3 grams fiber; 607 grams sodium; 466 mg potassium.